When we travel we like to get a feel for how local farmers live and farm. On a recent visit to Guatemala we had the chance to spend some time with Domingo a Mayan farmer who farms on a small area in the hills around Lake Atitlan, at an altitude of about 6,500 feet. The first thing we realize is that in Guatemala white corn is king. It is not only a major crop but it’s also the main food source for much of the population. Tortillas made from a dough of ground white corn and water are the staple food for many, and it is never hard to find a place that sells them. 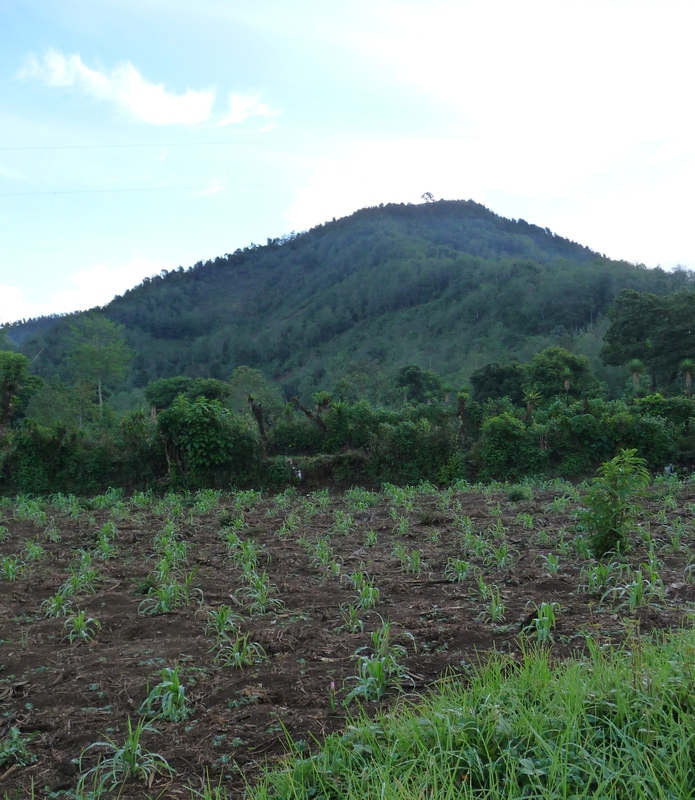 While US farmers grow yellow corn primarily for feed or ethanol, in Guatemala farmers are often growing white corn for direct consumption by their families. Also in contrast with the US, where farmers are used to talking about farm sizes in the hundreds or thousands of acres, in Guatemala, as in much of the developed world, acreages are much smaller. Domingo lives in a picturesque town on the shores of Lake Atitlan at about 5,000 feet above sea level but he farms at an even higher altitude, at about 6,500 feet. Although the volcanic soil in the area is an advantage, his limited acreage and his inability to afford much in the way of better quality seeds and fertilizer limits his yield. On his 2.5 acres of land Domingo grows corn, coffee, beans, and a few lesser crops. About 1.25 acres is devoted to corn, with some of the land having been continually cultivated without crop rotation for 70 years. There is only one crop of corn each year and Domingo primarily uses seed from the previous year to plant his crop. Every day Domingo gets up well before dawn to make his way to his fields, bringing his breakfast/lunch of 16 tortillas made by his wife from corn he has grown, which he eats at 10 am. This is all he will eat until he has dinner at 6 pm (having returned home at about 2 pm). Dinner again is likely to be simple with beans and tortillas and maybe some eggs. Meat is definitely not a daily menu item. It is a measure of how important tortillas are that one of the key indicators of inflation is how many corn tortillas you can get for 1 Quetzal (the Quetzal is the Guatemalan currency – 1 Quetzal is worth about 12 cents US). In the past you could get 8 then 6 and now only 4 tortillas for 1 Quetzal, and now even the size of the tortillas seems to be shrinking as well. Corn is planted in Jan/Feb during the dry season and is getting close to knee high by April when the wet season begins. Harvest usually takes place in October/November once the wet season is over and the dry season has started again. The corn is sun dried still on the cob, and once dry Domingo uses a small hand driven machine to decob the corn. Corn is stored in 2 small silos, one that holds about 1800 pounds and another that holds about 800 pounds. The corn needs fertilizer and it is added at a couple of points in the growing season. He also uses any organic material available as additional fertilizer, including anything available from home. Chemicals are occasionally used against weeds, but as they are expensive, application is infrequent. Instead the hoe gets used a lot. From his 1.25 acres of land Domingo is usually able to get a yield of approximately 50-60 bushels per acre. This corn is the staple food used to feed his extended family of 7. Even though the younger generation doesn’t eat as may tortillas as before, the family still manages to go through 3-4 pounds of corn per day. The tortillas are cooked on a wood fired stove, even though the family has a gas stove as well. This is because with a wood fire three “burners” are available all day and can be used to continuously cook tortillas whereas with the gas stove the gas is used less efficiently and ends up costing a lot more. But, this also means that Domingo, his family, and the rest of the town burn a lot of wood every day. In fact it is quite common to see large piles of chopped wood on street corners around the village waiting to be distributed. In addition to corn, Domingo also grows some coffee on about 7/10 of an acre. He is able to produce about 500 pounds of high altitude coffee beans each year with the beans being a valuable source of cash income when sold. Domingo also grows edible beans as another source of food for the family as they can be planted with the corn because the two are excellent companion crops. While definitely not an easy or an overly profitable existence Domingo and his wife have managed to raise 4 children. Although they lived for a while in the city after they were married they eventually returned to the small town to take over the family acreage. Perhaps tellingly though none of their children today are too interested in continuing in the fields, at least for now. This entry was posted in Uncategorized and tagged corn tortillas, Guatemala, white corn.